Lui Tuck Yew should think out of the PAP box by looking at faces of change and possibility. Transport Minister Lui Tuck Yew appears to be a PAP hero fighting WP’s nationalized public transport proposal at one hand and attacking NSP’s opening up bus services to more operators in the other end. Whatever and however his fighting spirit is, he cannot run away from the mindset of the PAP and continues to position himself within the money box. Lui’s assumptions on our public transport are a reflection of the PAP’s mindset and government standard operation procedures. He seems to base on the following assumptions to defend his transport policy. Lui noted that the two public transport operators - SBS Transit and SMRT - run a mix of profitable and loss-making routes which they are obliged to do so under their universal service obligations. Indirectly, according to Lui, by opening up public transport system, he cannot demand private operators to provide services to the loss-making routes. And it will lead to control problems. Obviously, the PAP wants to control the operators. With so many operators, if allowed, some even operated by low cost ‘foreign talents’, it will be a situation that the PAP finds difficulties to control and manage. They prefer to control 2 big ones rather than many small ones. Creating certain kinds of monopoly, providing them with profit incentive and then ultimately, controlling them is the business ‘normal’ of the PAP. This applies to media, banking, telecommunication, and other key industries. 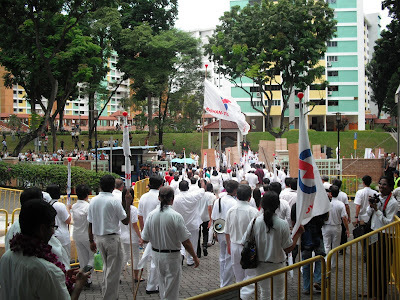 PAP mindset: So, they are afraid of losing the control. No controlling power, the government cannot function as effective as it wants. PAP Position: Nationalized public transport system will lead to a welfare state and commuters could end up paying more. The PAP is always against welfare state and their philosophy is to make the rich becomes richer. If the wealth of the nation is not distributed to support the poor, of course, at the end of the day, with inflation, the poor will have to end up paying more. Because of state ownership, Lui thinks public transport productivity will decline and more subsidies are needed to maintain the system. Not to forget our public transport although semi-government owned has not achieved the highest productivity in the world. There are productive public transport systems, like the Taipei metro, and their tax payers have not complained about it. To be rich, there are gives and takes. The government is too well aware of the fact that without the low base of foreign workers, our businesses will not be able to make more money. Hence, there is good reason to maintain an affordable public transport system. This is also good for businesses. 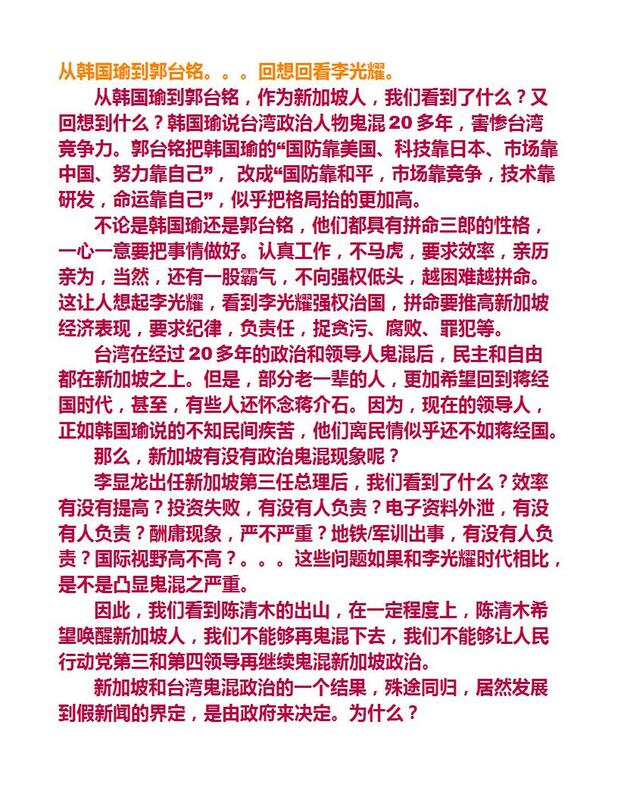 You just can’t want a good and productive house but don’t feed the house well (又要马儿好，又要马儿不吃草). An affordable public transport system is key to productive workforce. Since the 2 public transport operators can do a CROSS SUBSIDY, as a nation, there is also a possibility that the government can do a cross subsidy from the rich to the poor. If the public transport operators can take care of the loss-making routes so do the Singapore government. As a nation, they PAP should also take care of Singapore citizens by cross subsidy from the rich (profit-making routes) to the poor (loss-making routes). This will enhance the harmony and cohesiveness of Singapore. PAP mindset: So, the PAP is not willing to help the poor. They allow cross subsidy for public transport operators as the PAP can control them. But the government disallows cross subsidy (from rich to poor) as they cannot control the people (and voters). PAP position: Loss-making routes are always loss-making regardless who is the operator. There is no ‘change’ in thinking and their solution is to think within the (control) box. Lui’s most ‘in the box’ thinking is his view of the "cherry-picking" of lucrative routes. Because of the usual monopoly thinking, controlling and providing profit assurance, the PAP has pre-set the situation. He has failed to realize that the problem of loss making routes can turn into profitable ones. His assumption of loss could be a profit for others. Just like HDB flats, private developers can still make money on state lands and not like HDB always complains about making losses. Just an example, you can get a haircut for $5 from a Chinese barber in your HDB estates, but you need to pay $ 7 or $8 for a local barber. This is a bad example but it shows the possibility – from loss-making to profit-making for some people. Has Lui heard of Islamic banking? The Muslim religion does not allow interest for loan but how come we see the Islamic banking is booming? How do banks make money under no interest principle? PAP mindset: So，the PAP needs to think out of the box – both money making and political controlling. Their old ways of money politics and mindset need a total change for the new political ‘normal’. Change: Who will ever think of the most beautiful foreign minister in the world is from an Islamic country – Pakistan? 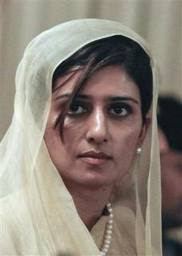 Pakistan Foreign Minister Hina Rabbain Khar is only 34 years old, young and pretty. help us think out of the box? I wish one day Singapore will have such a weapon of mass distraction so Lui and other PAP ministers can look at a similar Ms Khar and think out of the box to solve the public issues in Singapore. SINGAPORE'S 40 richest people are worth about US$54.4 billion (S$65 billion) in all, a 19 per cent increase from last year despite faltering share markets and a fragile global economy. Hi, Mr. Lui you have a choice, to look at the beautiful face or the money faces to think out of the box. Many will look at the pretty face for stimulating ideas and solutions. Good luck, Mr. Lui. Or good luck Singapore where is our Ms Khar alike? Can the PAP move away from profit-maximisation model? Can the PAP move away from profit-maximisation model? And learn something from Jing Shang. When Singapore Management University (SMU) board of trustees chairman Ho Kwon Ping comments on the failure of business schools to convey the right ethical values to students, I wonder whether this can also apply to the PAP or not. He, therefore, advocated a shift from the profit-maximisation model of business to a more balanced view of performance. This sounds familiar to Singapore Inc, a country manages like a company and the sole purpose seems to focus on profit maximisation only. The Singapore government since independence has been engaging in profit-maximisation model. Not only the government and its agencies are doing businesses, even the suppliers of public goods like public transport and housing also focus on profit making. I am not sure about Ho’s suggestion of ‘balanced view of performance’. Can we assume and extend it to include quality of life, a balanced and managed growth for the benefits of Singaporeans, or a protection of minimum life support for the poor? Of course, Ho is talking about business and I should not put words on his mouth. However, because of Singapore Inc, the PAP is running Singapore like a business. What Ho’s calling for business schools to take a more critical view of themselves, in a keynote address at the 12th International Conference of the Society for Global Business and Economic Development has its significant reference to Singapore Inc as a business identity. He dismissed a trend among business schools to offer courses on ethics and corporate governance as superficial. 'Business schools should not see their role as just trying to mitigate their graduates' future ethical lapses by rolling out more courses which try to impart ethics or business sustainability. Hence, when manages the Singapore Inc, the PAP should consider its role and responsibility in the society. It used to do these in the early years for employment, affordable housing and transport. <Murdoch gives Singapore top marks for ministers' high pay> -- maximising pay for ministers? <NTU's 2011 grad earns $20,000 a month> -- maximising starting pay for new graduates? -- maximising profit for a gambler? <S'pore will spiral down if govt is weak> -- maximising power for maximising profit? Who cause the social ills? Can we afford to slower down with a better balance between profit and life? Is there a need to give An (Hong) Bao year after years, especially before elections? We owe Singapore society a debt of not caring for people who are left behind and who are disadvantaged under the profit maximisation model. I have just finished watching the series on Jing Shang晋商（山西Shanxi businessmen）. Hundred years ago, Shanxi businessmen built their businesses overall China and even expended them to overseas. They had input culture (drama, opera), values (mainly Confucianism), and trade into one solid foundation for doing business. Through culture and values, they planted the seeds of trusty, honesty and loyalty into their businesses. Shanxi businessmen were the ones who established the modern financial institutions (票号) more than hundred years ago in China. As we all know, without trusty, honesty and loyalty, a financial institution will not survive and expand. These financial institutions were established without law and legal protections (there was no company, banking and financial law) and no formal acknowledgement from the government (there was no legal person status). In the later years toward the end of their closure，these financial institutions even sacrificed themselves for the benefit of their depositors. Which financial institutions today will sacrifice themselves for their depositors? If this is the case, there is no need for central banks in the world to pass laws to protect the interest of the depositors. For those who can understand Mandarin, I recommend you to watch the last episode called “Old trade mark 老字号”. It is a summary of the whole series. Of course, if you have time, it is beneficial to watch the whole series. This can also serve as a typical case study for business schools on social responsibility. At the Deyi Nomination Centre, you could see the organization efficiency of the PAP and the inefficiency of the oppositions. However, when came to effectiveness, it seemed to be the reverse. Peter F. Drucker, a 20th century Austrian social scientist and author of many books on organizational management said that businesses should strive for effectiveness in contrast to mere efficiency. A quote from Drucker's book, The Effective Executive, says that "Efficiency is doing things right, effectiveness is doing the right things." The PAP has an excellent grassroots support and is able to send many people to the nomination centres on the nomination day. They did it in an efficient way, dividing into different GRC, SMC teams and arranging different time for them to march into the nomination centres. Days before the nomination day, the PAP already did the planning asking supports from the PAP branches, NTUC and even RCs or CCCs. LKY even said that PA was also part of the PAP. These people (I don’t like to use the word ‘supporters’ as I believe some may not vote for the PAP eventually) were given some incentives to attend the nomination day event. Transport and food were provided as the PAP could get sponsors easily. Due to efficient management, these people were disciplined and obedience. Some could not take the heat and ambulance had to be called. And most of them are not working like housewives, retired persons. Of course, there were some die-hard supporters who took leave. On the other side, you could see supporters of the oppositions coming in alone, 2 or 3 or in a group 5 or 6. Although some supporters came in blue, however, most of them wore different colours. Almost all the PAP candidates only looked at their own supporters when they made their speeches. That included PM Lee. Sometimes, the shouting was so loud that you could not hear the speeches of the PAP candidates. While there were many PAP people there, but they were ‘speechless’, “soundless’; there were no cheer leaders; and they did not even look like a united force even though all wore white. <<For example 1, think of a company that was successfully making buggy whips as automobiles became the mode of transportation. Assume that the processes used to make buggy whips were perfect. The relationships of internal and external suppliers and customers were perfect. The suppliers and customers teamed together to make perfect buggy whips. The buggy whips were delivered on or ahead of schedule at the lowest possible cost. This company was very efficient. However, the company and its strategists were not very effective. The company was doing the wrong things efficiently. If they had been effective, they would have anticipated the impending changes and gotten into a different market. The buggy whips (like the PAP people) were delivered on or ahead of schedule at the lowest possible cost. (It might be no cost at all as they are many willing sponsors). This company (like the PAP) was very efficient. However, the company (like the PAP) and its strategists were not very effective. The company (like the PAP) was doing the wrong things efficiently. If they (the PAP) had been effective, they would have anticipated the impending changes (expectation, desires of Singapore voters) and gotten into a different market. Why rally turnouts were so different? The first example is about manufacturing - hardware and the second is talking about care – software (hearts). There is a limit to the PAP’s efficiency. When you need a participation of 10,000, 20,000 or 100,000 people, you need effectiveness. There are common values or meanings for people to participate in a mass rally. Just like a football match, you could see the difference between Singapore lion vs. Malaysia tiger and the S-league matches. Why the former could get a big turnout? 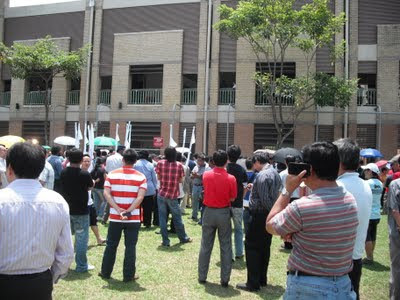 There was no problem for the PAP to get 1,000, 2,000 or even 5,000 to their rallies. But there is a limit on hardware (sponsored logistics) and software (willingness to come). If you consider Jasmine revolution, people who stood against the authority were equipped with poor weapons or no weapons at all. But how come an inefficient group of people could become an effective force to overthrow the establishments? Among the potential candidates, Tony Tan has the best support and most efficient campaign machinery, but whether he also has the effective software to attract voters and win their hearts or not, we will have to wait and see. He has already begun in his soft approach by caring for a child, giving speeches, lunching with bloggers and even attending religion event. Moving forward to a right direction?